Most people find it very useful to start by visiting our showrooms on Granby Street. Browsing our 21 displays over three floors in a relaxed environment allows customers to get a real feel for how we work, who we are and what we can offer. This is a good time to ask any questions and have an informal chat about our products, services, associated trades, broad costs and timescales. From here we can arrange a home/site visit or a time to sit down in the showroom and discuss plans. This process can take around an hour either in our showroom with your plans, or at your property where we would survey the room. We do welcome walk in enquiries with plans but would suggest that an appointment be made in advance so we can have a designer present to give you the time you deserve. 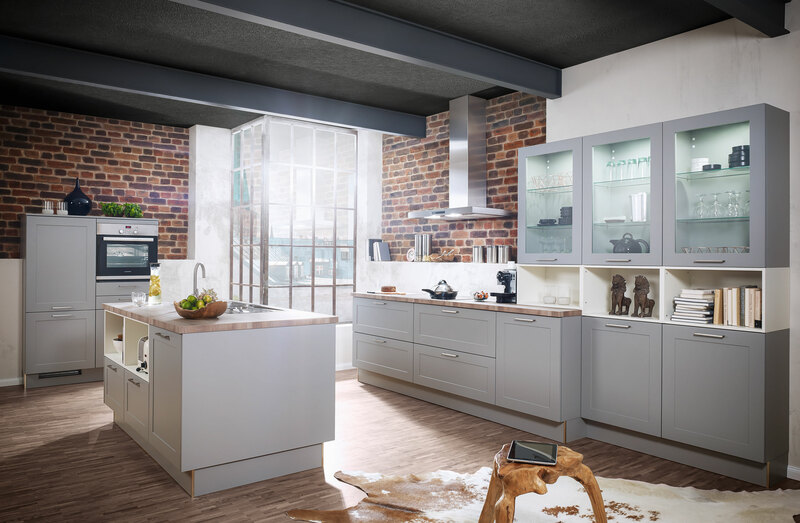 During the consultation you will be asked questions covering every aspect of your new kitchen: style and finish of furniture, worktops and appliances and the important smaller details which make the design personal to you. We will discuss possible ideas for layouts and listen to your own thoughts. A date and time is then set to get together in the showroom to look at the initial design. Having discussed your thoughts and needs in depth, we can now start to bring it to life using our state of the art computer aided design soft ware. This produces incredibly accurate photo real perspectives. Considerable time and thought is put into this process using our skill and knowledge to ensure we get as close as possible to your dream kitchen. This meeting takes place in our showroom where we can present our initial design in detail to you using our showroom displays to illustrate many of our ideas. We will have detailed plans, perspectives and a fully itemised quotation clearly detailing costs and what is included. From here we can develop the design, discuss any alterations that may be necessary and proceed to final choices and colour schemes. Once you are happy with the proposed scheme we can start to turn the vision into a reality. At this point we take a deposit and will confirm a fitting date. We will arrange to visit the site once again to double-check all relevant details. We can liaise with various other trades to ensure a smooth running project. On the day agreed for the installation our fitter(s) will arrive and our installation manager will oversee their work. Your designer (or a colleague) will also be on hand to ensure that all is running smoothly. Once the installation has been completed, we ask you to sign a certificate, which starts the 6 year warranty period. Any snags or damaged goods will be dealt with as quickly as possible. We are aware this can be a stressful time for customers and are on hand to deal with any concerns that may arise. We provide you with detailed user and after care guidelines to ensure you get the best out of your new fitted kitchen. It is important to register your appliances for any increased guarantee period that may be on offer from the manufacturer. From here, you can start to enjoy your new fitted kitchen and we hope it will give you many years of service and pleasure.